The new Global Data Protection Regulation (GDPR) is a long and costly task that will imply numerous, and sometimes deep, changes in your business and processes. From the designation of a Data Protection Officer (DPO) to the implementation of encryption technologies to protect personal data, the GDPR will impact your organization at all levels. To answer the growing needs of our customers for guidance and GDPR-ready software, Atos with the Evidian IAM Suite present the key aspects and features of our Identity and Access Management products that will empower your organization in a context of strengthened regulation. While no single technology will by itself ‘solve’ GDPR, Identity and Access Management (IAM) is explicitly or implicitly required at every stage of the compliance process. This document highlights how IAM solutions answer GDPR requirements related to User Access and Security of Processing (Art. 5 to Art.32). The Evidian IAM Suite can be integrated to the Atos Continuous Improvement Cycle, among many elements in the wide range of security, monitoring and process improvement tools allowing dealing with the wide ranging impacts of GDPR. 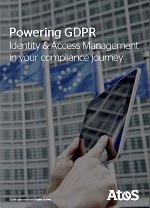 Download our brochure: “Powering GDPR – Identity & Access Management in your compliance journey” to get an insight into what Evidian IAM Suite can bring to your GDPR approach.